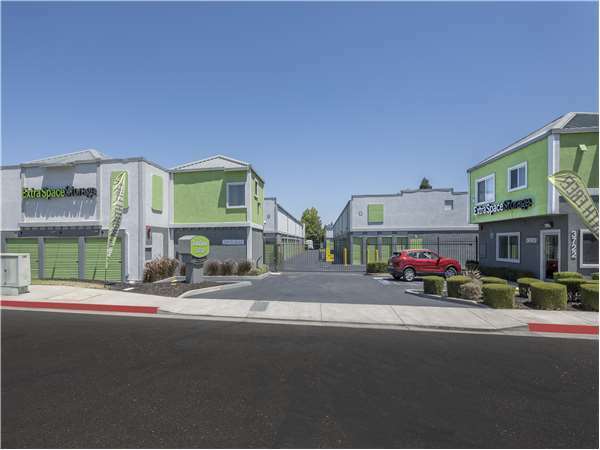 Located near the intersection of Old Santa Rita Rd and Santa Rita Rd south of I-580, Extra Space Storage serves residents of Pleasanton, Dougherty, and Asco. Locals will recognize our facility behind Golf Galaxy and Trader Joe's in Rose Pavilion a few minutes north of ValleyCare Medical Center. Extra Space Storage on Old Santa Rita Rd offers a wide range of storage units, vehicle storage, and exceptional security. We're the convenient storage solution for you in Pleasanton! With units ranging in size from 3x3 to 10x30, our Pleasanton storage facility can handle items large and small! Units come with features like indoor access, first-floor access, elevator access, and drive-up access. At Extra Space Storage, we're committed to the safety of our customers. Our Old Santa Rita Rd location has an on-site resident manager, 24-hour video surveillance, and electronic gate access. If you need to store a vehicle in Pleasanton, Extra Space Storage provides 8x15 outdoor parking spaces and 10x11 to 10x30 enclosed drive-up units that can easily handle cars, motorcycles, boats, and RVs. Extra Space Storage is dedicated to high-quality self storage and exceptional customer service. Our facility is always clean, well-maintained, and secure, and our friendly, professional team truly cares about giving each of our customers the personalized attention they need. 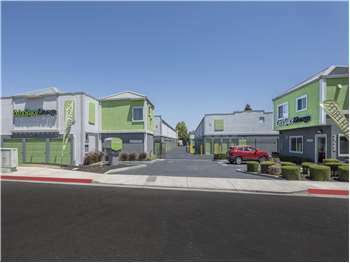 Contact us today to reserve a storage unit in Pleasanton! Great customer service and friendly staff. Units and area are clean and well maintained. I would recommend this storage facility to any of my friends and family that were in need of storing things. ExtraSpace made the entire process of storage, access, contracts, and service all seamless for me. I would highly recommend ExtraSpace! My monthly rate has gone up $40 per month since I opened my account in June 2016. There is never a notice that goes out when price increases happen, just that surprise you get when you look at your credit card statement. The unit isn't climate controlled, so I am no longer sure what the benefit is of keeping my personal property in this storage facility. i was in press about how quick the process was also the attention and awesome help. Places is well kept and the price was right. Thank you ladies. The facility that I am in is an excellent ran place. Even though I was directed to another location for storage, I am extremely happy to have chosen this one! The lady in the office was great! She was friendly and efficient. The compound was secure and in a very convenient location. I would definitely recommend this facility to all. Maria was a great help in getting us all setup even when there was all problems in the paperwork due to some IT glitch. the place is neat and tidy - the moving in experience is great and all the units look good. In the past I used 2 storage facilities, and to tell you the truth, though the Customer Service of the Old Santa Rita is good, still does not necessarily mean that the restroom remains filthy! For 3 days in a row, this restroom was a disgrace. Regardless how sloppy some "tenants" are, I have to tell you that the other 2 prior facilities I had my items, the restroom deserved a 5-Star. I do wish some change will be made in regards to this matter. I was a customer of Public Storage for a year too long. They get you in there with that $1 for 1st month rent. But thats so not the case after service charges and prorated fees since I came at month end. The rope to pull down my storage was old and to the point where you get splinters. I was so frustrated with PS. That I started to look around and find other storage units and came across Extra Space Storage and a sweet girl named Paetra helped me out and answered all my questions. There prices were even cheaper than PS! Paetra helped me into a space that fits my needs. She showed me a few units to best fit my needs. Thank you so much! This Facility is superb in everyway with the usuall security cams,unusally immpecabbly clean,security access etc you would expect from other storage facility but the medium size of the whole facility is a big plus big enough for large transport trucks and most importantly the staff especially Paetra is dedicated,very pleasanton and delightfull just to talk to and she remebers your name WOW! Folk's it just doesn't any better than this....try it you will not regret it! This facility is exceptional clean and well maintained. The credit goes solely to the hard working management. Management also graciously coordinated with us our move from the storage unit. The facilites were easy to get to, secure and carts to assist in unloading and loading car. I would rent again. Very clean facility. Convenient operating hours. Manager has been very helpful and friendly. W'e're very satisfied with the cleanliness of the facility and the way it's maintained. It's also reassuring to know if there is a problem getting in or out when there is no staff on duty, that there is someone to call for assistance. The only thing we don't like is the frequent rent raises, which are higher than the rate of inflation. Nothing but good things to say about Extra Space Storage. Thanks! 1 block north of Valley Hospital on Old Santa Rita Rd/Old Santa Rita Rd & Santa Rita Rd. We are on OLD Santa Rita RD, right across from the street from KarTunz. Look for our new bright green doors! From I-580 take the Tassajara/ Santa Rita exit south past Rosewood Dr. Make a right onto OLD Santa Rita Rd. and make right into Driveway. We are on OLD Santa Rita RD, right across from the street from KarTunz. Look for our new bright green doors! Take Santa Rita Rd to Old Santa Rita stop light. Make an Left on Old Santa Rita Rd and we are about 2 blocks down on the right hand side. We are on OLD Santa Rita RD, right across from the street from KarTunz. Look for our new bright green doors! From Hacendia Dr. make a left on to Owens Dr. . Take Owens to Andrews DR and head east on Andrews Dr. From Andrew Dr. you will make a left on to Old Santa Rita and we are on the right about a block down.